Nope. Not a cat. 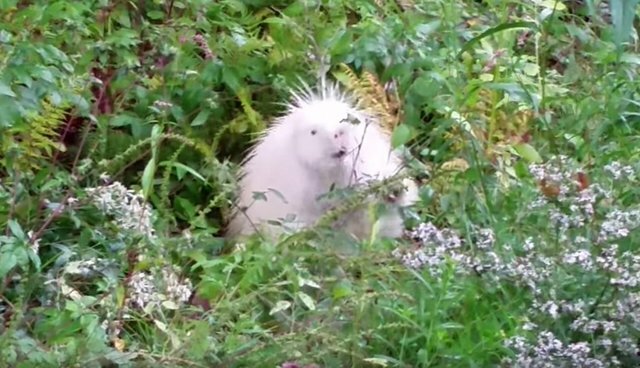 Actually, he's a glorious albino porcupine - whom Lichty caught on film nibbling on some leafy greens. According to biologists, albinism affects only about 1 in 10,000 porcupines, which means the pale-hued animal seen that day is very rare indeed. Fortunately, despite the fact that he's had a much tougher time hiding from threats, the hungry porcupine has made it into adulthood looking perfectly plump and healthy, winning the hearts of folks lucky enough to see him.